‘Success is sweeter and sweeter if long delayed’ is a saying that will find no argument from 18 year-old Sydney native and new Houston Ballet apprentice, Joel Woellner. 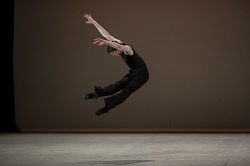 Though he chose not to compete the first time he qualified for the semi-finals, Woeller’s patience has been ultimately vindicated after winning two prizes at this year’s Prix de Lausanne. Over 250 hopefuls aged between 15 and 18 years old submitted DVDs to this year’s Prix, from which 20 competitors made it to the final round. Woellner was the only student from an American ballet school [Houston Ballet Ben Stevenson Academy] to win a prize. Ranking sixth overall out of 78 international competitors, he was awarded not only a scholarship but the competition’s contemporary prize. Congratulations on your success Joel! How would you describe what you were feeling when you heard that that you had won two prizes? Surprised, yet a huge amount of satisfaction! Having had such a vigorous training schedule, putting so much energy into Prix, then having it rewarded, is one of the best things I have felt. But even if I hadn’t placed, just being on stage at the finals of Prix de Lausanne is a moment in my life that I’ll never forget. How did you prepare for the Prix? The first time I was accepted [for the 2012 competition], Houston Ballet decided to hold me back for a year, so I didn’t go. This time though, I started my training for the Prix as soon as I heard that I was accepted. My teachers had agreed on my variation, so I went to YouTube to learn the choreography and to draw inspiration from the videos of professional dancers who had done it in the past. Once I’d learnt the steps to the variation I began visualizing myself in costume on the stage of Prix de Lausanne. I was then given rehearsal time with one of the Houston Ballet teachers, Andrew Murphy. Together we set the steps to music and slowly began to correct the variation. A few weeks later we were running the variation through and working very hard on perfecting every step. Mr. Murphy is well-known for running variations multiple times to build stamina and I was not an exception. After each rehearsal my legs were on fire, my lungs burning and my heart about to pump out of my chest. In each rehearsal, however, I visualised myself onstage dancing the variation perfectly. I found that once I had gotten to Prix, dancing my variation on stage was easier because I had already been onstage in my mind. For me visualising is essential and a great tool that gives me confidence. How did you select and prepare your contemporary solo? 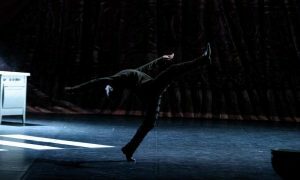 I first saw my contemporary solo on the website of the Prix de Lausanne and instantly fell in love. The combination of the music, and the fluid and effortless movements of it captured my attention. I really love to tell a story through movement and emotion and I knew this solo was going to let me do that. I started rehearsals with my contemporary teacher, Pricilla Murphy. Her coaching was incredible! She taught me how to articulate my movements, as well as to keep a strong centre. Throughout my rehearsals with her I learnt so much about my body and how to dance in a truly contemporary style. The day before I left for Switzerland a showing was put on in the studio theater at Houston Ballet. The company members, the artistic staff and the Artistic Director were invited to watch, so many people came. This experience was a ‘dress rehearsal’ of what the Prix was going to be like. I was very nervous but I was well prepared so the performance went smoothly and the experience gave me so much confidence. I felt very self-assured afterwards and I knew that Prix was going to go well. What do you think the judges were looking for most in their potential Prix prize winners? I think the judges are looking firstly at the dancers’ technique and physique — can they dance steps confidently and do they physically look the part on stage? I also think they look at whether or not a particular dancer can survive in a professional environment. From the small amount of company life that I have witnessed, I have noticed that the ability to learn and apply corrections to choreography is crucial. Someone that can take on board what a choreographer or artistic director is asking will always succeed. Having rehearsals with the choreographers of the contemporary solos represents a chance to showcase and improve upon this ability. How have your wins affected your training goals? Being a scholarship winner allows me to receive an apprentice contract with an associate company of the Prix de Lausanne. I’m proud to say that I have been offered and have accepted an apprentice contract with Houston Ballet. However, I know I’m not the ‘finished product’ as a dancer. Being a part of the company and dancing beside so many amazing artists will push me even more. I aim to work as hard as I can so that one day I may be as good as the people I’m dancing next to. Prior to the Prix, you had also competed at the YAGP in 2010, at which you were offered and accepted a Houston Ballet II full scholarship. Do you think international competitions are important to a dancer’s development? It’s clear that international competitions provide exposure and the chance to be offered places in professional schools. International competitions also allowed me to compare my abilities with the rest of my age group around the world. That year [at the YAGP], I didn’t make the finals. I remember being disappointed, but I have always looked at this experience as a positive and I really think that’s how all competitions should be viewed. I knew that I wasn’t yet up to scratch with the rest of my age group so I was determined to make sure that I was. For me, competitions are what started my professional career. Without whom do you believe you might not have made it this far? I decided that being a professional ballet dancer was what I wanted to do with my life around the time I started high school, so I moved dance schools and started taking ballet classes with Jo Ansell and Kim Traynor [at Ettinghausens Dynamic Arts, Sydney, Australia]. Both took an immediate interest in my career. Their wisdom and knowledge helped me to improve my technique and choose the best path for my career. Ms. Jo and Ms. Traynor have been so influential in my career, and I want to thank them for their dedication and the hard work they have put into me. I truly believe that I would not be where I am today without their help. What advice would you give young dancers who want to compete in the Prix? The advice I would give is: Number one, absorb everything you can from the week. Every correction the teachers and coaches give you is invaluable. Stay in contact with every friend you make because the ballet world is so small that at some point down the road you are likely to bump into them again. Number two, try not to think of the Prix de Lausanne as a competition and get hung up on whether you make the finals or not. Instead, look at the week as a way of enhancing your abilities technically and artistically. Photo (top): Joel Woellner competes at Prix de Lausanne 2013. Photo by Gregory Batardon.